1) Oh no, it’s a horrible colour! Yes, surprisingly, colour still ranks as the number one bugbear about replacement LED lamps. Clearly, out there on the streets, people are still experiencing the horrid cold blue light that the rest of us last saw during the Dawn of LED back in the Late Noughties. There is no need for this. Warm white LEDs are now commonplace. So here’s the top tip . . look on the box. If it doesn’t mention colour at all, don’t buy it. If it just says ‘warm white’ be suspicious of it, and if it is not in a box at all you’re probably in a unsavoury pub being offered knocked-off kit out of a plastic bag. In this case call the police. The colour number that you’re looking for is 3000K or lower, and there are a few more 2700K lamps coming to market. 2) It’s not very bright! An LED’s box is often a myriad of numbers, but do any of us honestly know what they mean? More than a few LED lamp suppliers have played fast and loose with light output figures and I have been looked in the eye and told absolute fibs about light values. Every electric lamp should have its light output stated on the packaging. 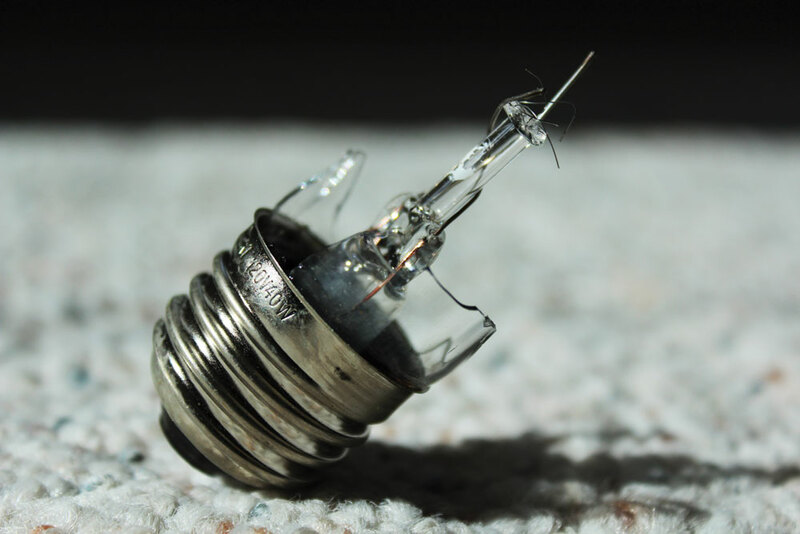 The old 60W light bulb had a light output of 600 lumens (10 lumens per Watt). If that’s what you’re looking for, make sure that an output of 600+ lumens is quoted on the box before you take it to the till. 3) Er, where’s the light gone? I’ve experienced this one myself. As you’ve probably noticed LEDs are actually clever bits of electronic circuitry rather than a hot wire in a glass bulb. There is usually a metal casing at the bottom of the glass (or plastic) lamp, with the lamp cap fixed at the bottom. An LED’s casing does two jobs, it contains all the electronics and dissipates the heat that is created within the LED itself. The case also stops a lot of the light from going backwards. So if you have a traditional wall light or standard lamp where the lamp points to the ceiling, you’ll find that there’s far less light coming downwards, making a room too dim to read in, for example. You will need to look around for LED light bulbs that take this into account. You’ll recognise them as they look as if the glass (or plastic) bulb has slumped over the metal casing. The slumping of the diffuser is what you’re looking for because it makes sure that more light goes backwards – down to where you need it. 4) My dimmer’s stopped working! Two basic things here; firstly, not all LED lamps can be dimmed and, secondly, not all dimmable LED lamps can be dimmed by ‘ordinary’ dimmers. LED manufacturers have tried hard to develop dimmable lamps that are compatible with older dimmers. The problem is that the two technologies are so different, so where it does work it may work poorly. The best thing is to swap-out the old dimmers at the same time as you invest in dimmable LED lamps. Seek specialist advice. Talk an electrical wholesaler. There is some good kit out there, it’s just a matter of finding it. 5) This is just nasty dull light. Where’s my sparkle? This will be experienced mainly with replacement candle lamps. The first LED versions used opalised diffusers to distribute the light. Happily, there are now several manufacturers who are producing LED candle lamps that look for all the world like the original filament lamps – and some of them even dim as well. Which is really something.